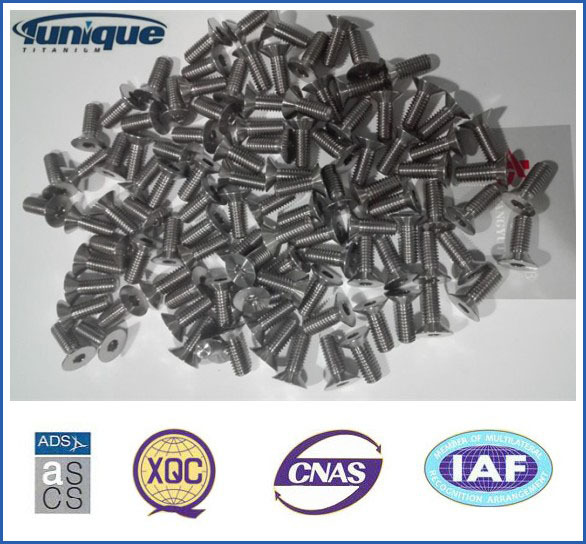 We are specialized in the production of DIN, ANSI/AMSE, ISO, JIS and other standards and non-standard high-strength titanium fasteners. Usually include bolts, screws, nuts, washers, retaining ring, and various special-shaped pieces. Firstly, we will do the heat treatment, chemical composition testing, mechanical properties testing of titanium bars, titanium plates and other basic materials. After the process of straightening, leveling and polishing, cut into the appropriate size. And then proceed to turning, hot stamping, compression screw, heat treatment, polishing, cleaning, inspection, and a series of procedures, eventually to produce the high quality titanium fasteners. We have the advanced production equipment which ensured our products to achieve the best in each production link. Looking for ideal Titanium Screws for Sale Manufacturer & supplier ? We have a wide selection at great prices to help you get creative. All the Gr2 Titanium Screws are quality guaranteed. We are China Origin Factory of Good Quality Gr2 Titanium Screws. If you have any question, please feel free to contact us.